What do you think is the most effective way to increase your pull ups? If you’ve been training for a while and you’re an intermediate trainee, then you probably already know that the best way to do that is to train with lot’s of volume without burning yourself up. The best method to achieve this is, of course, the GTG (Greasing the Groove) method. But what if you don’t have a pull up bar available at all times? What if you can’t apply the GTG method in your own training? I came up with a solution to this problem. Namely, with the 1-Hour Pull Up Workout. With this workout, you’ll be able to train with lot’s of volume – and thus increase your pull ups – even if you don’t have a pull up bar available at all times. The only drawback of this workout is that it requires one full hour. But this isn’t much, for the simple reason that you don’t have to do this type of workout more than once per week to reap the benefits. After reading this far, you may be wondering…. 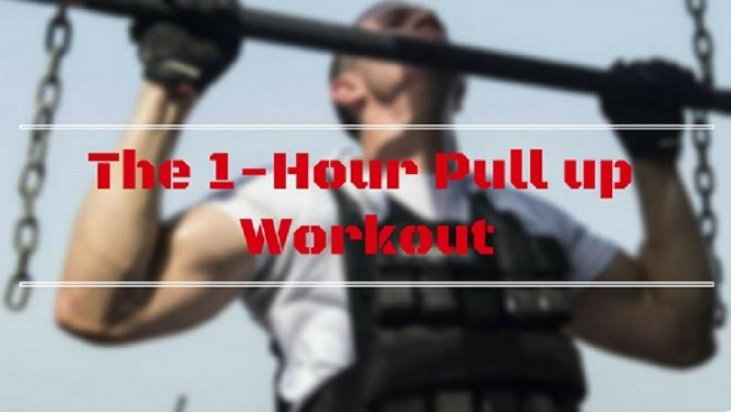 First of all, a workout completely focused on pull ups, that required more than 1 hour, would seem very intimidating and you’d have lot’s of excuses to not do it. Second of all, a workout that required less time would defeat the purpose. The purpose of this workout is to train with lot’s of volume. To train with lot’s of volume you have to train with lot’s of reps and lot’s of sets. To be able to train with high reps during most of your sets, you’ll have to rest appropriately between your sets. And to be able to train with lot’s of sets, you need time. Thus we have 1 hour. However, you aren’t going to train your pull ups for the whole 1 hour. The first 15 minutes consist of the warm up. In the warm up, you’re going to prepare your shoulder joints and your upper body for the workout that follows. 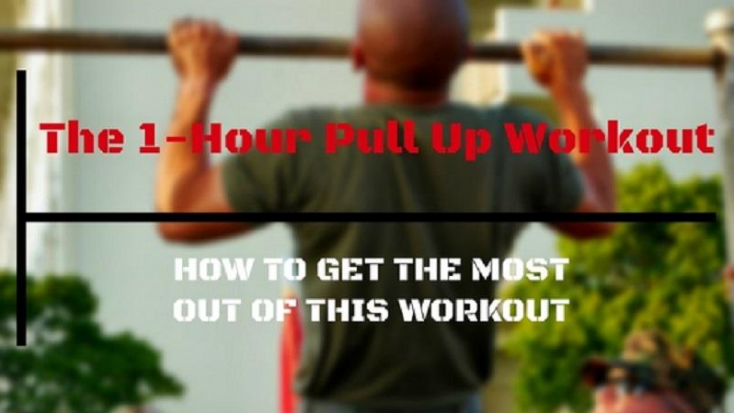 In the rest 45 minutes, you’re going to do as many pull ups as you can. However, this is not an AMRAP workout as you’ll see later on. In the 15 minute warm up, you are going to prepare your upper body for the pull ups. Keep in mind that your warm up is very important since you will be training with very high volume. So, don’t take it lightly. Since in the workout you are going to train only with pull ups, the warm up can be focused only in the upper body. Particularly, the shoulders/scapula, the upper arms, and the forearms. You will go from A1 to A2 with 30s rest in between. After you complete 2 sets of A you will move to B. Between circuits A and B, use the rest interval of A. Perform the rest of the warm up in a similar fashion. If you perform the warm up strictly it will take you less than 15 minutes to complete. This will allow you to be a little more “relaxed” regarding the resting periods between the warm up circuits. If you have a lot of time left after the warm up, you can use the remaining time to do some more stretches or warm up exercises. Lastly, you can do some of the warm up exercises during the workout (between your working sets) to keep your self loose and prepared for the next one. 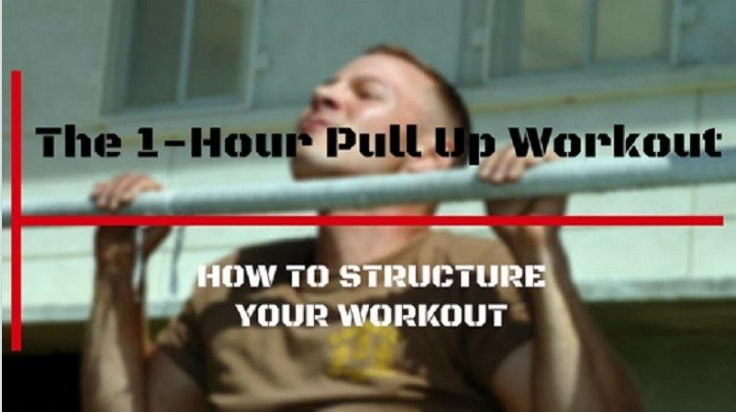 During the 45 minutes, you re going to do as many pull ups as you can. However, this isn’t an AMRAP workout for two reasons. First, your rest periods are going to be fixed and they’ll ranging from 3:30 to 4:30 minutes long. Second, the number of reps/set will also be fixed. First, you will have to find out how many pull ups you can do in a row. Then, based on that number, your reps/set will range from 50-70% of your total reps. If, for example, you did 10 reps, your sets would consist of 5-7 reps. If you did 5 reps, then you’d train with sets of 2-3 reps. When you start with this workout, I suggest you train with 50% of your total reps.
How much should you rest? As you probably remember, the rest periods are between 3:30 to 4:30 minutes. When you are starting out, I suggest you to train with 4:30 minutes between your sets. After a while you can start decreasing the amount of rest gradually. I like to always have the same amount of rest between sets throughout the whole workout, as it’s easier to remember and keep track of. Usually, after your last set, there will be some time left before the 45 minutes are over. Use this time as a break and when the 45 minutes are over perform one last set to failure doing the negative portion of the very last rep as slow as you possibly can – that’s the “finisher” set. This will help you do a lot more in your next pull up workout. When you first start out, you may not be able to complete all the required reps during the last sets of the workout. Your goal is to be able to do 70% of your total reps with 3:30 rest intervals. You can start with whichever feels better for you. However, I suggest you don’t mix up the two, as it will make everything more complicated. The best way to increase your reps/set is to try to increase the total reps of the workout at least by one rep each time (as long as the rest intervals stay the same). Based on my experience, it’s better if you “add” the new reps during the last set of the workout and then implement them in the beginning. So, if in your last workout you completed 9×5, in the next workout you’ll try to add reps in the last set. If you manage to add 3 more reps to the last set, then in your next workout you’ll add 1 rep in the 3 first sets. After this cycle is completed, you can keep adding reps or decrease the rest intervals. In the above example, the “finisher” set wasn’t counted in the total volume. If during this set you can do more than 50% of your working reps (in our example, 3 or more), you can add 1 extra rep to your next workout (along with the other extra reps). Decreasing the rest is a little trickier as it will mess up with the reps you’ll be doing in each set. For this reason, I like to first increase the total reps and then decrease the rest intervals. This allows me to train with at least 50% of my max reps more easily. I also suggest you keep the same rest interval for the whole workout. I personally like to make big jumps of 30s, but you can decrease the time more gradually if that’s easier for you. Once you can complete 12×7, you can test once more your max pull ups in a row and come up with the new parameters. If you’re satisfied with your max pull ups or you can do more than 20, then you can make this workout harder by training with a harder pull up exercise. Even though the workout is very straight forward, there are things you can do to improve your results. The easiest way to do that is to have a pen and paper when you are performing the workout. Each time you complete a set, write down how many reps you were able to do. By doing this, you’ll be able to track your progress very easily. I wouldn’t recommend you to train with this workout more than once per week. Apart from being very time consuming, there are other training options that you can combine with this workout. For example, you can use a workout that is completely different than this one. In the 1 hour workout, you’ll be training with fast and moderate to high amount of reps, lots of sets, and big rest intervals. To counter it, you can have another workout in which you train with slower and fewer reps, few sets, and small rest intervals. How Can I Add This Workout To My Current Training Program? This can be a little tricky, because the workout is quite long. As far as I’m concerned, there are only 2 effective ways to add this workout to your current training plan. If you are training 3 times per week, this can be very easily done. You can “remove” the pulling exercises from Friday and add the 1-hour pull up workout on Saturday. If you are training with the 3 Month Bodyweight Extreme Workout, which doesn’t have any pulling exercises into it, you can add one extra day dedicated to pull ups using the 1-hour workout. If you are training more than 3 times per week, you can follow a similar approach but you have to be mindful of your weekly workload in order to avoid overtraining. This is a little more advanced. Instead of adding an extra training day, you can add a new training session in a different time of the day. So, if you trained in the morning with a regular bodyweight workout, you can train with this one in the evening. However, to pull that off effectively, you should already be used to working out twice per day. Otherwise, you’ll miss lot’s of workouts – mostly due to habits. If your workout plan is already full and you can’t add this workout into it, don’t worry. There are a lot more effective strategies that can help you do more pull ups. You won’t be able to do more pull ups just by reading about this workout. 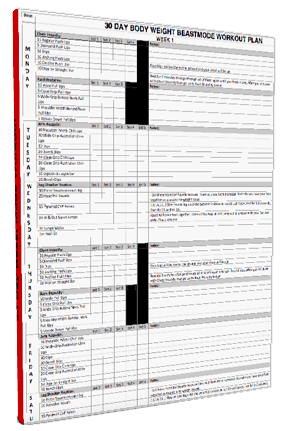 So, take out your training sheets and add this workout into your training plan. Better yet, try this workout today! And find 9 more strategies to help you do more pull ups. Nick is the founder of ATS, a site dedicated in helping you get stronger with calisthenics faster. Awesome workout plan! I’ll definitely give this a try! I’ve typically done more lower rep weighted pull ups in the past. But this looks like a great way to increase by volume capacity.